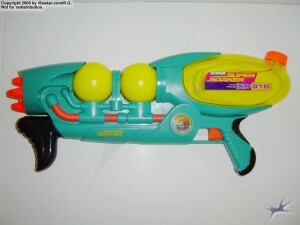 The Super Soaker XP 310 was the largest air pressure water gun released by Larami Ltd. in 2000 under the Super Soaker XP line. For all intents and purposes, it can be thought of as the big brother to the Super Soaker XP 220, sharing the same colour palette and some similar styling, though also being quite different since the XP 310 features dual separate air pressure chambers. Interestingly enough, unlike in the case of my XP 220, I did take a series of pictures of my Super Soaker XP 310 still in its original packaging. 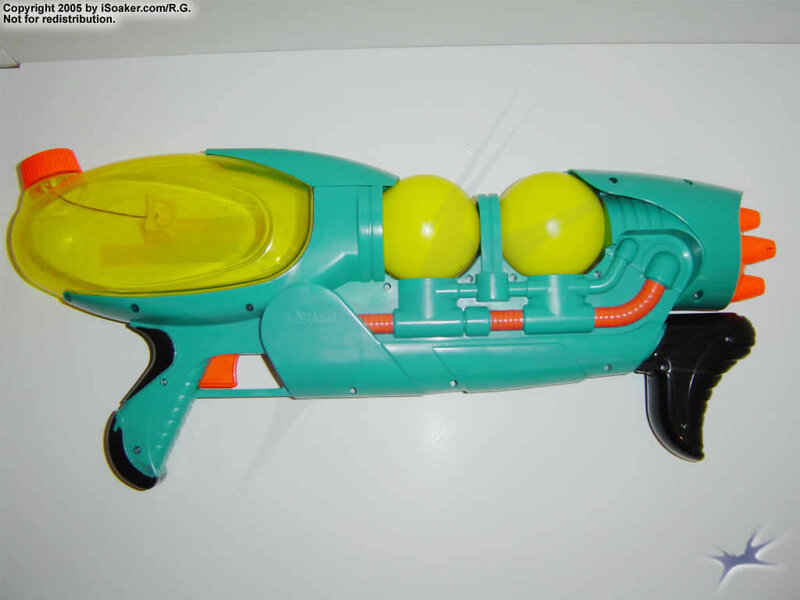 As sown in the image on the left, most of the blaster is in full view when the box is viewed from the side. Only part of the trigger/grip region is obscured by a partial cardboard tab with all call out noting that the Super Soaker XP 310 is supposed to carry 25% more water than the older Super Soaker XP 110. As was measured at iSoaker.com, the actual increase appears to be 22.5%, but that’s fairly close to the advertised value. 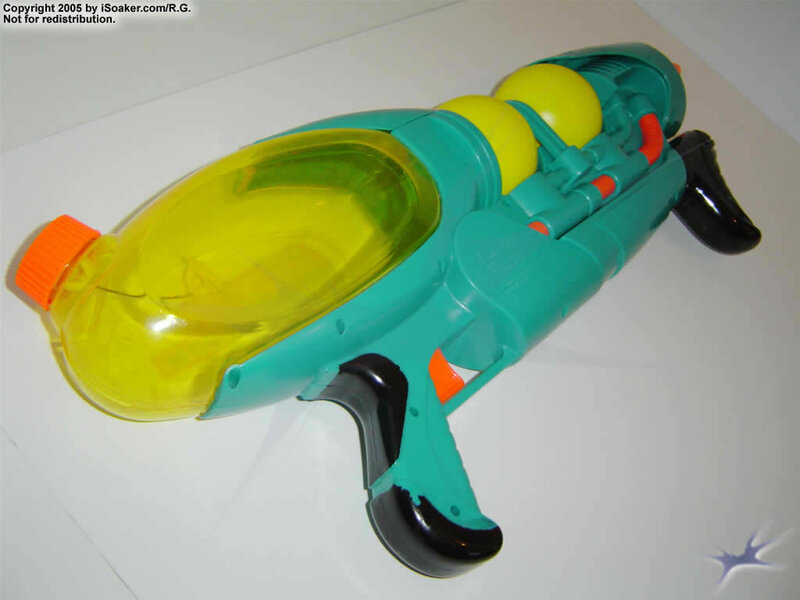 One thing that can also be surmised is that the XP 310 was intended to be the updated version of the 1998 Super Soaker XP 110. In many ways, the spirit of the original XP 110 can be seen in the XP 310 from the dual spherical separate air pressure chambers to the rear-mounted transparent tank and the left-side mounted pressure gauge. Unlike the XP 110, the XP 310 has a nozzle selector with four nozzle settings to choose from; the selector is easily seen even when the XP 310 is still in its box though its settings are less obvious from this side view. 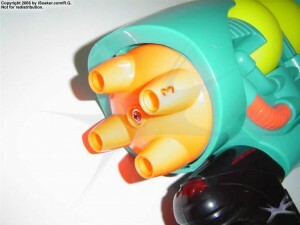 The back of the XP 310’s box offers added details on the different parts of this water blaster. The plastic ties that are used to secure the XP 310 to the front side of the packaging can be seen, partially obscuring parts of the graphics. 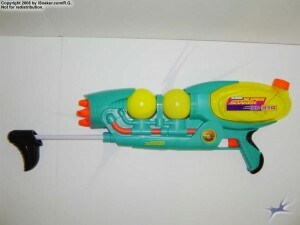 Some other Super Soaker models released in 2000 can also be seen including a picture of the Super Soaker XP 220. Free from the packaging, the full glory of the Super Soaker XP 310 can be felt. 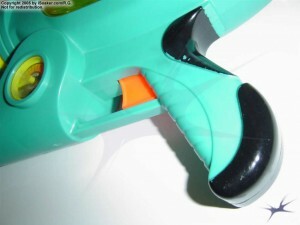 The unique shape of the pump grip seems to stand out a little more once the box is removed; its design appears meant to be more balanced with the height of the trigger/grip region. Beyond that, thanks to the already open nature of its packaging, the only other part that is easier to see is its nozzle selector, but more on that component soon. With a dual separate firing chambers, the XP 310’s pump is designed to pull and push water, not air. As can be seen, pump stroke length is quite reasonable. Pump volume is a respectable 30mL (~1 oz.) and does a good job at quickly pressurizing the firing chambers. The pump grip, itself, is notably taller, but shorter in length than most standard pump grips. Its unique shape means one’s pump hand hold the grip a little differently than usual. The height and non-centered positioning of the grip to the pump rod means one needs to be slightly mindful when extended the pump quickly, but one easily adapts to this pump fairly quickly. 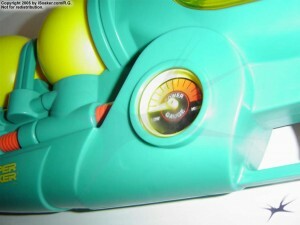 Nevertheless, the concern for unintentionally prying the grip from the pump-rod remains partly due to the sunken, shorter point of attachment between the grip and the rod. The trigger-grip region for the XP 310 is simple, functional, and works well. The trigger pulls smoothly while the grip is adequately textured and sculpted, making it comfortable to securely hold, even if wet. The bits of black detailing on the trigger-grip help to complement the pump grip’s black colouring. The XP 310’s reservoir occupies the rear ~2/5th of the blaster. Made of yellow, transparent plastic, one can easily see how much water remains; of course, one’s opponents can also see this as well. The reservoir is filled via a port that is sealed by a tethered, screw-on cap. As with other blasters that have these anchored tethers, the plastic anchor swings freely when the cap is attached, tapping against the inside of the reservoir quite easily when the reservoir water level is low. The dual separate pressure chambers are linked to each other, feeding the selected nozzle with a respectable volume of pressurized water when properly filled. As noted above, pressurizing is achieved by pumping water from the reservoir via the pump into these chambers. The XP 310 also features a pressure gauge on its side which gives the User some indication of whether usable firing pressure has been achieved by pumping. While not particularly accurate in terms of absolute pressure units, it does help new Users to recognize that the XP 310 should be pumped so that the need is well past mid-point to get the best stream performance when the trigger is pulled. For even better overall performance, it is advisable to pre-pump the pressure chambers first with air and the pressure gauge works perfectly at helping one determine when the firing chambers are primed enough. The Super Soaker XP 310 features a nozzle selector with four nozzle settings to choose from. Unfortunately for the XP 310, all the nozzle settings are varying stream settings with minor differences in diameter between settings. Having a smaller, water conserving stream and a good performance stream are nice, but having two additional intermediate-sized nozzles does not confer additional attack flexibility on the field. Were one some sort of spread or burst setting and the other a full-on riot-blast-type setting, the value of having four options to choose some would have been more apparent. Alas, in the stock version, two nozzles tend to be the most useful and the others are there, but don’t offer any added benefit. The other problem with the nozzle selector is that there is no visual cue letting the User know what setting is selected unless one it looking at the nozzle openings, themselves. On my XP 310, I took a Sharpie and labeled the nozzles 1 through 4 in order of increasing size. 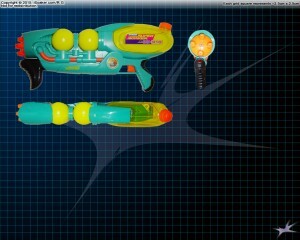 All-in-all, despite some minor short-comings, Super Soaker XP 310 is a solid performing air pressure water blaster. Complementing perfectly in function and color-scheme with the my Super Soaker XP 220, I, personally, participated in many-a-water-fight using the XP 310+XP 220 combination. While not as hard hitting as a true CPS-class water blaster, the Super Soaker XP 310 can definitely hold its ground in most situations and its largest nozzle setting offers respectable output and range. Together with its quick-to-prime dual separate pressure chambers and good-sized reservoir, the Super Soaker XP 310 makes a great addition to almost any armoury. Enough reading – time to get soakin’!